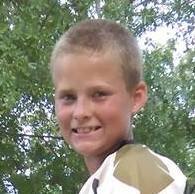 12 year old Jace loves the outdoors, playing outside with his brothers, and enjoys basketball, football, and wrestling. He is active and loves to ride his dirt bike. One day, after riding his dirt bike, Jace complained of hip pain. The pain did not subside over a period of two weeks, so he was taken to the doctor for an x-ray. The x-ray showed what looked like spikes coming out of his left hip bone. An MRI showed a tumor. A biopsy was done, and the tumor was malignant, and Jace was diagnosed with high grade osteosarcoma. Jace was referred to Peyton Manning Children's Hospital where he began 2 months of high dose chemotherapy. After those two months, he underwent a 5 hour pelvectomy to remove the tumor and affected bone. His hip was replaced with a cadaver bone. Jace was hospitalized for a week following the surgery. Jace was home about a week from the hospital when he lost all movement in his lower extremities, developed a fever, and experienced uncontrollable pain. Doctors found that he had developed several large abscesses and a hematoma around the surgical site. He returned to the hospital in Indianapolis where he stayed 3 weeks undergoing treatment for staph, another surgery to drain the abscesses, and to be placed in a spika cast. Jace is expected to finish chemotherapy in June 2017 and his prognosis is good.